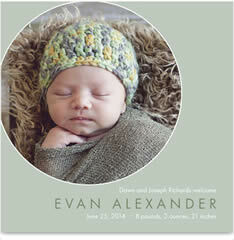 3 FREE Personalized Birth Announcements! Head over Cardstore.com, choose 3 birth announcements, and use code CAK2963 at checkout to get them for free! You can personalize with your own photos and text, and you'll also get free shipping! Offer valid Friday, 8/17/12 8am EST Monday, 8/20/12 11:59pm EST.